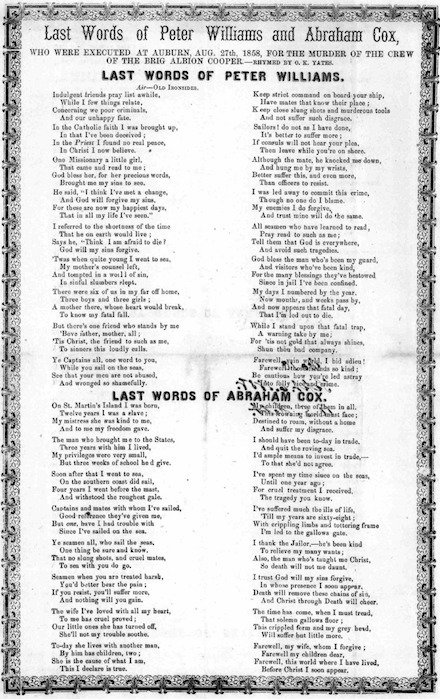 Peter Williams and Abraham (or Abram) Cox were hanged on this date in 1858* in Auburn, Maine, for the maritime murder of the crew of the Albion Cooper. They’ll tell you all about it in a lyrical “last words” that would have you believe they did a musical number on the scaffold, to the air of the Oliver Wendell Holmes poem “Old Ironsides”. 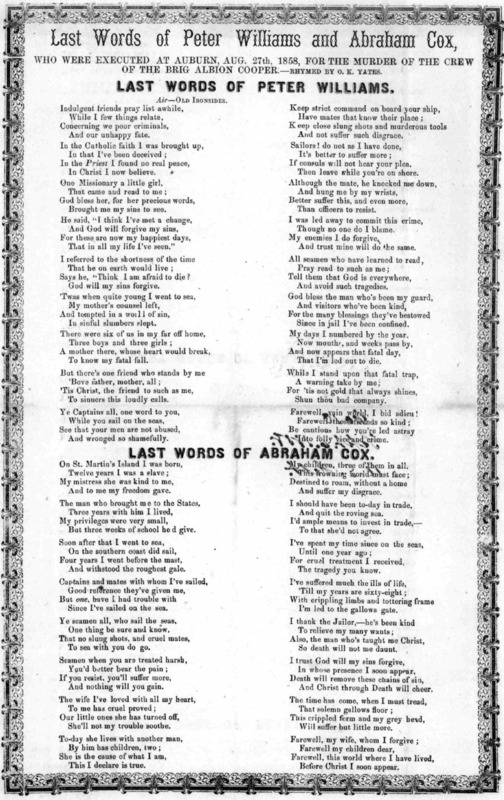 A couple of fine gentlemen have done us the favor of making a shanty of the poem on YouTube, if this helps put you in the mood, although, since “Williams and Cox” imitate Holmes’s meter and nautical theme but not his brevity, you’ll need to run it back a few times if you mean to make it to the end. * The Espy file of U.S. executions erroneously attributes the double hanging to August 27, 1860. Thomas P. Lewis, master of the ship Adelaide, loading guano at Elide Island, off the coast of Lower California, was killed there on the 12th ult. by Wm. Williams, colored cook off that vessel. Three other vessels happened to be there at the time, and the officers united to hold a court, taking six sailors as part of the jury, and tried Williams, convicted him of murder, and then hanged him on the island. Elide Island is a “naked rock, one mile in circumference” off the coast of Mexico’s Baja California which for a few years in the mid-19th century was heavily exploited for its guano supplies. 28,000 tons of bird crap later, the supply was tapped out. On this date in 1858, Charlotte Jones and Henry Fife hanged side by side in Pittsburgh for murdering Jones’s elderly aunt and uncle the year before. But their dying confessions insistently exonerating their death-sentenced co-accused led the governor to pardon Monroe Stewart ahead of the latter’s scheduled hanging later that February. Fife, Jones, and Stewart had been tried and convicted together in the so-called “McKeesport Murder” or “Wilson Tragedy”. The reader will infer that it entailed the murder of a man named Wilson in the city of McKeesport. “Maddened by a thirst for gold and stimulated by drink I gave them the fatal blow that robbed them of life and sent their souls, without warning, to the bar of God,” Fife lamented in his scaffold confession. George Wilson had been stabbed to death; Elizabeth McMasters bludgeoned with a poker until her brains spattered the room. Their 27-year-old niece, our Charlotte Jones, was the one who reported the murder but it would soon become painfully apparent that she had lacked the poise for this high-stakes bluff. She had already the reputation of a woman of low morals, and her suspicious eagerness to leave the vicinity brought her in for close questioning. It was not long before Jones served up a confession. In her initial iterations of this statement, Jones implicated not only her lover, 22-year-old Irish shoemaker Henry Fife, but Fife’s friend Monroe Stewart. It seems that this was a bit of panicked vindictiveness on the part of Mrs. Jones, for Stewart had often counseled his friend to kick Jones to the curb. This denunciation was enough to see all three condemned in an 11-day trial in July of 1857. Post-conviction, Fife would join Jones in admitting guilt, but both exculpated Stewart of any part in the crime. And in the subsequent odyssey of appeals and clemency petitions, it was really only Stewart’s fate that remained at issue. His whole hope centered on the Supreme Court. He believed firmly that there would be a reversal of the judgment of the court below in his case, and when he found the hope which had buoyed him up suddenly destroyed, his self-possession deserted him, and he gave himself up to a degree of anguish that surprised while it pained his fellow-prisoners. 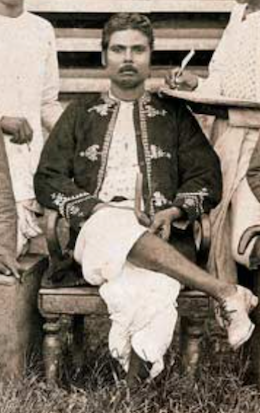 He still proclaims his innocence, and maintains that, though a thousand courts held otherwise, he is guiltless of the blood of the Wilson family. 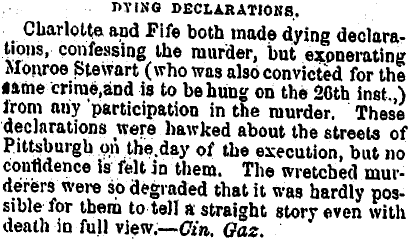 Fortunately for him, Stewart did not hang with Fife and Jones but was slated to die a fortnight later. 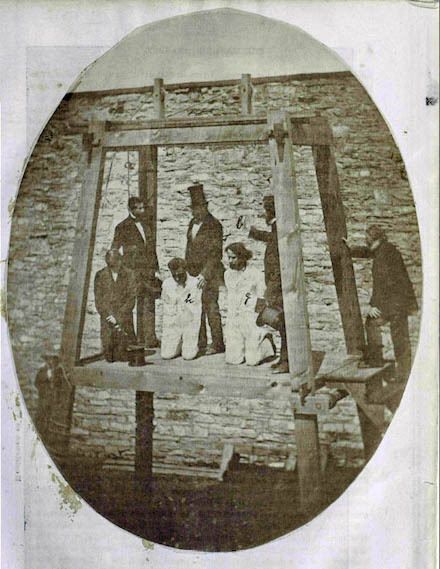 By execution day, Jones was in a state of near-collapse — “utterly broken down and bewildered,” according to the Pittsburgh Gazette‘s report (as reprinted in the Harrisburg Patriot and Union, Feb. 17, 1858). “She cried bitterly, and every now and then uttered incoherent sentences — now stating that she desired to die, and again declaring that she was afraid of death and wished to live.” The lengthy execution prelude on the scaffold, as she multiplied over and over the terrors of her imminent death while Fife tried to console her through interminable prayers, statements, and other ceremonial niceties, must have been agony. Jones’s statement (read by a spiritual counselor) and Fife’s (which he delivered himself) both owned the murder while insisting that Monroe Stewart had no part in it. Outgoing Gov. James Pollock* had had no time for this ploy in issuing Stewart’s death warrant, and even in the hours after the hanging newsmen speculated that this exculpation carried little credibility. But a new man, William Packer, had taken office between the death warrant and the executions, and Packer thought better than his predecessor of Stewart’s protestations. He pardoned Monroe Stewart days before his February 26 execution. * In the hours after the crime, Fife buried sacks of $20 gold coins and silver half-dollars and dollars along the bank of the Youghiogheny River. He only had one chance to recover the money later and couldn’t find the hole; neither could the authorities when he later described the hiding place from his condemned cell. Finally, in 1880, two boys accidentally ran across the cache … only to have a passing stranger with “a heavy red beard and red hair” immediately relieve them of the treasure and hurry off into the mists of history. ** Pollock later directed the Philadelphia mint and helped spearhead the first introduction of the “In God We Trust” motto on U.S. currency. Murderer Owen McQueen(e)y was hanged on this date in 1858 at Gallows Flat down the road from Old Geelong Gaol. McQueeney, a wandering Irish robber with one distinctively sightless eye, committed something called the “Green Tent Murder” which consisted of the slaying of the pretty proprietress of a structure that went by that name. The Green Tent was a grocery and tavern serving Australia’s ample population of itinerant gold-hunters in the environs of Meredith, Victoria — specifically the environs of present-day Green Tent Road. Fresh off a jail term for horse-rustling, McQueeney turned up at the ‘Tent in July 1858 and began creepily haunting the pleasing mistress with the well-proportioned stock shelves. Until, for no known provocation save plunder, McQueeney murdered the widow owner Elizabeth Lowe and fled. The poor woman’s body was chanced upon soon thereafter and travelers’ reports of a dead-eyed and overladen swag-man making tracks for Geelong soon zeroed the search in on the desperado, still carrying Ms. Lowe’s incriminatingly distinctive property. 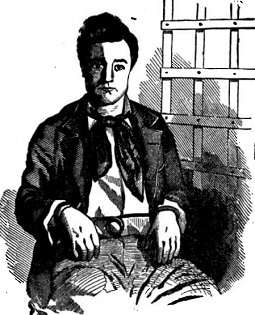 McQueeney, who was noted for his obnoxious bravado from the moment of his first police examination all the way to condemnation, evidently labored until almost the very last “under the infatuation that he would yet be reprieved … on the ground of the great aversion entertained by a large class of people to capital punishment under any circumstances. This belief of his in the morbid sympathies of his fellow-creatures, there can be no doubt, induced him to the last to disown his crime” even though he admitted to many other ones. Nevertheless, he continued his irascible act all the way to the noose, griping at the executioner for holding him too tight and pulling the hood down too soon. Notwithstanding (or better owing to) his notoriety, McQueeney was sought out posthumously by a crippled woman, who besought the indulgence of the sheriff to touch McQueeney’s dead hands to her own in hopes of obtaining a curative from the legendary power of the hanged man’s hand. Modeled on London’s Pentonville Prison, Old Geelong Gaol — officially HMS Prison Geelong — hosted six executions in its initial incarnation from the 1850s to the 1860s. Two occurred within its walls; McQueeney’s and three others took place in a paddock a few hundred meters away. Old Geelong Gaol was converted in 1865 to an “industrial school” for street urchins, and 12 years after that into a prison-hospital. The dusty old place, famous for is spartan amenities, resumed life as a working gaol after World War II and only closed in 1991 — but never had another hanging after the 1860s. Today it is open for public tours, complete with gallows exhibit.